Some people love their t-shirt and jeans, but I’m more of a shirt and skirt kind of girl. Nothing brightens my day like an easy embroidered t-shirt, a full a-line midi skirt and a street corner sprinkled in confetti (coincidentally from another pair of bloggers who were shooting down the block). It’s the little things in life, right? 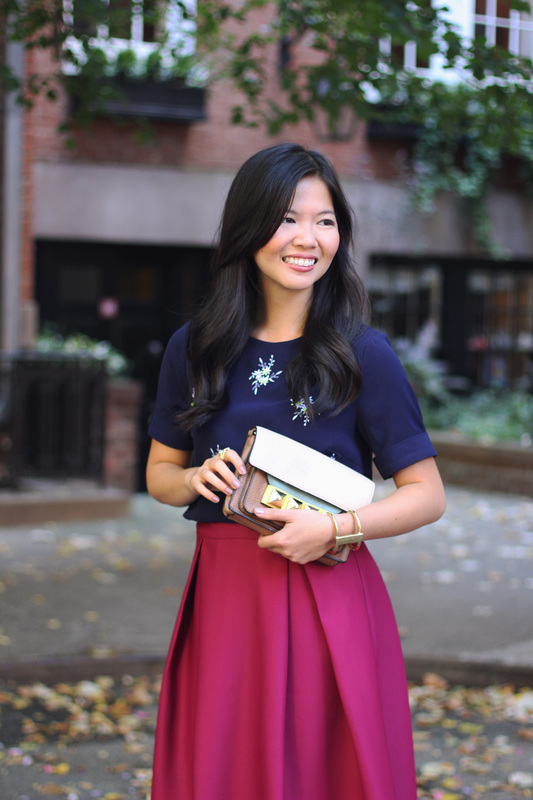 Loving the print on your top, and the color of the skirt is so pretty! This look is so gorgeous! 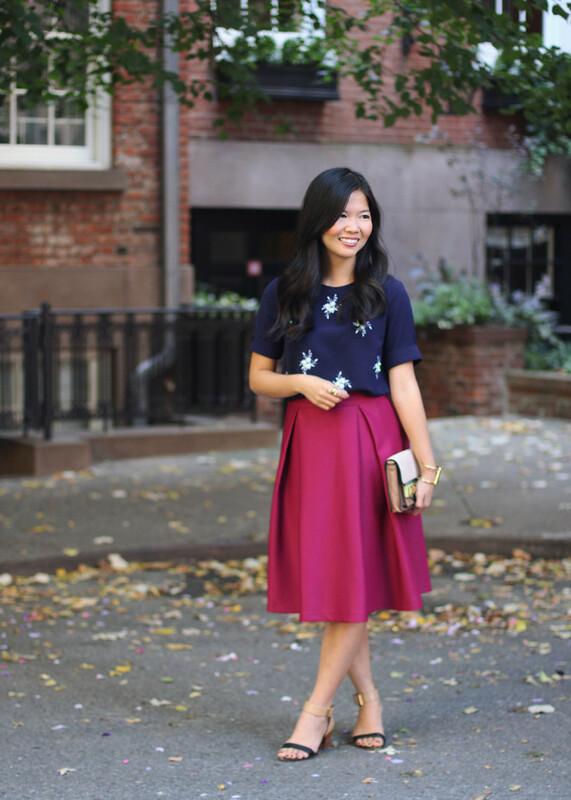 The jewel tone of the skirt is so perfect for this time of year. Gorgeous skirt! 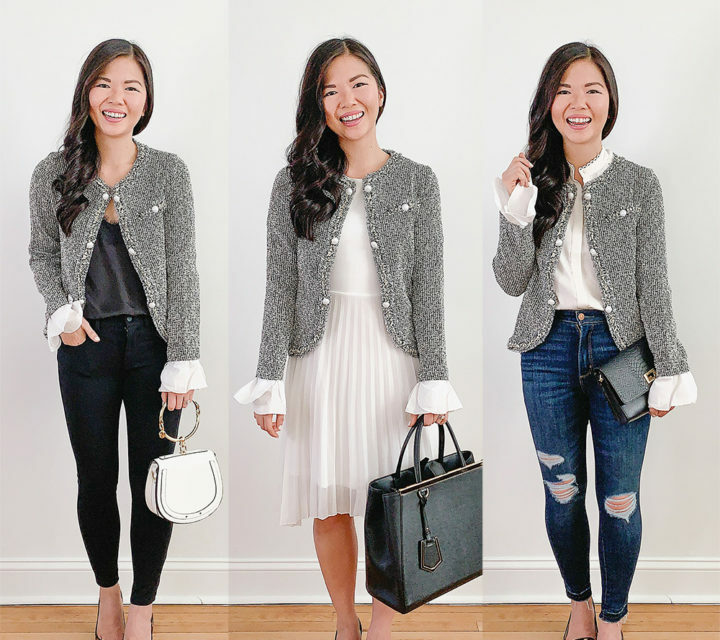 The fit and shape of these look great on petites! Love the outfit. Much more you than a tshirt and jeans. That’s pretty funny that there’s confetti on the ground from a nother blogger shot. It really is the little things in life. That skirt is gorgeous! So chic! Love that skirt Jenn…such a pretty color! This look is just too cute! Love your embellished tee. I love this midi with that top! So gorgeous! You look so pretty! I love your skirt! Love the colors you paired together here! You really seem to have a great eye. Gorgeous midi skirt. So so pretty! I love the colors and details! I love that skirt. The color is so beautiful. Loving the way you paired it with a navy top. So beautiful! i’d love if you checked out my blog! Obsessing over this combo! Very chic. You look gorgeous! Perfect from head to toe. I’m in love with the colors of the shirt & skirt – they look so beautiful together! Navy & Fuschia – PERFECT! Love this look! Especially the top!